In Float it's easy to remove a budget from your cash-flow without deleting it permanently. 2) Untick the 'Include this budget in my scenario' option. This will remove your budget from the cashflow but keep it logged. You'll see that once the budget is no longer included, the budget options can't be edited. To re-activate these options, just tick the include option and the budget will be included in the cash flow once more. 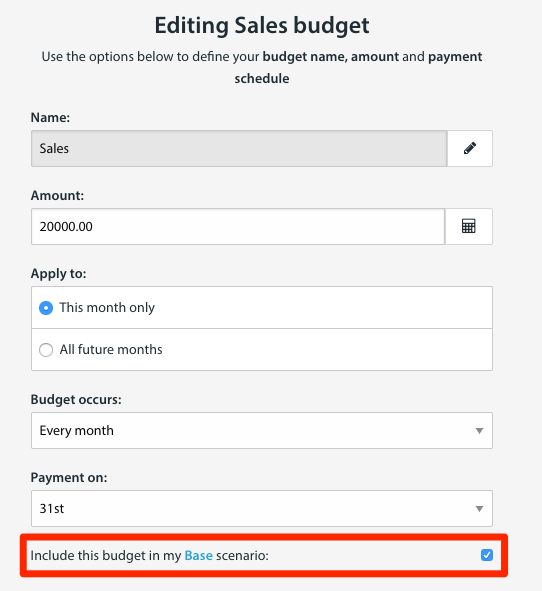 Remember: Float automatically switches from budgets to actuals at the end of the month. Another reason why Float will use an actual instead of a budget, is if your actuals have exceeded the budget.